It is a funny, intuitive and customizable tool launched by the Instituto Puleva de Nutrición and the ‘Objetivo Bienestar’ campaign from Atresmedia Group (Antena 3, La Sexta, Onda Cero…), supported by the Spanish Heart Foundation (Fundación Española del Corazón) and Semergen, the main general practitioners and primary health care association in Spain. The App, which has been developed by Cuatroochenta, was presented in Madrid during the #corazonescontentos event on the occasion of the World Heart Day, and is now available for free download on Google Play and the App Store. Corazones Contentos was designed for smartphones to help people live a healthy life, as if they played an interactive game. 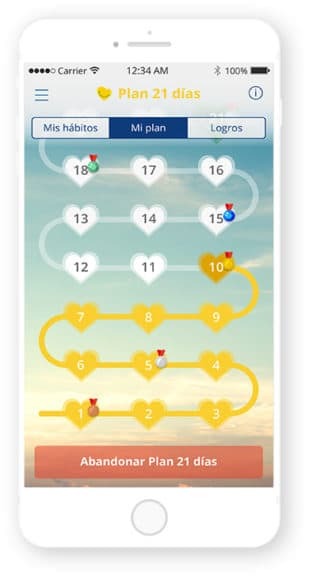 The App allows you to take the Corazones Contentos Test, the largest cardiovascular prevention quiz ever carried out in Spain, which has already been completed by more than 400,000 people on the web. It is easy and quick, and it contains questions such as the type of fat you use in cooking or the number of fruits you eat per day. With this information, it shows your ‘Corazón Contento’ index together with some recommendations. At the beginning, you can choose three eating and/or exercise habits. This number can be expanded as you complete them, in order to improve your Corazón Contento index by giving up smoking, exercising regularly, sleeping over 6 hours a day, having 5 meals a day and a diet rich in Omega-3 fatty acids, etc. The App reminds users the habits they want to improve by notifying them with the chosen frequency. Users must report their accomplishments in order for the App to do the tracking. Users can share their healthy habits goals and improvements, as well as applaude their friends’ objectives to increase their level of commitment. The App allows users to include their running habit by measuring distances, average speed and burnt calories for each session. The App includes a section for offers, where you will be able to participate in draws to stimulate your goals accomplishment. commodo justo id libero sed diam felis amet, libero.